Keith Singleton Horticulture has been supplying our customers with high quality garden and pet products for over 40 years. We are a friendly and experienced family-run business based at our large multi-functional production site in Cumbria, on the edge of the Lake District National Park. Supported by a dedicated and highly motivated team of professional staff we are fully committed to ensuring you get the best quality products at highly competitive rates. We supply our compost products to many of the top UK growers of onions, leeks, auriculas, alpines, begonias, dahlias, geraniums and many others. Regular users include the Royal Botanic Garden Gardens, Edinburgh; the Soil Science Institute at Liverpool University and many other universities, educational establishments and top commercial growers. We also supply all manner of fertilisers and garden sundries. 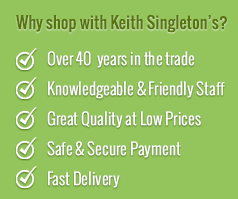 We very much hope you enjoy the convenience of secure 24/7 shopping with Keith Singleton Horticulture online, and we look forward to serving you many more times in the future.